Random pauses, screen greying out, and sudden drops in network traffic throughput on a stock standard HP Mini 110 1006TU with 1GB of RAM and running Ubuntu 12.04 LTS. Maybe this troubleshooting summary will help someone out there with their linux box. So here it is. I assumed it was just Ubuntu bloat, but it did seem to come on most predictably when switching quickly between the many running applications, or if the annoying update manager decided to do its thing automatically in the background. Clearly, the kernel was having trouble with the HDD. After deciding to do a scheduled "once every 3.5 years if it really seems necessary" backup to an external HDD, and managing to do so without difficulty, I had a play with the internal HDD. The swap partition was 2.8GB, and using the /dev/sda5 partition. gparted had no trouble re-formatting the partition and threw up no errors... which didn't really tell me much about the health of the swap partition. 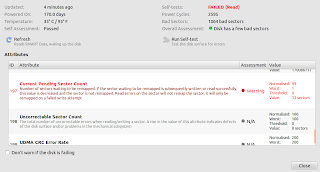 About 3 hours later with innumerable syslog errors, the mkswap failed claiming too many errors were found. I decided that the next thing to do was play with the location of the swap partition. To do so required booting off a different drive - but a netbook has no CD/DVD drive. The easiest way to do this is to download an ubuntu install .iso for the platform you are using, and find a USB drive to turn into a bootable live Ubuntu boot drive. This allowed me to choose the image .iso and install it onto a spare 2GB+ USB drive. I was then able to restart the netbook and boot off the USB stick by hitting F9 on booting to tell the BIOS to boot from the USB drive instead of the internal HDD. I ran gparted again, while booted off the USB boot drive, and was able to shrink the main root and usr partition /dev/sda1 by about 3GB. Having done so, I then grew the /dev/sda5 swap partition by 3GB into the freed up space. I then shrank the /dev/sda5 partition by 3GB leaving the space formally occupied by the (apparently somewhat trashed) swap partition unallocated. This completed the formatting without complaint within only a few minutes. 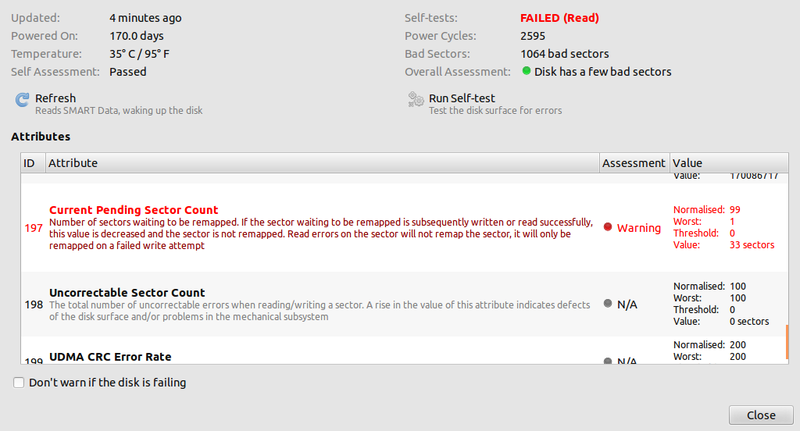 So, the problem was indeed the bit of disk with the swap partition, which was now unallocated. So, the UUID had changed and now the fstab needed updating by changing fstab's entry for the swap partition to the new value. a quick cut and paste and save, and fstab had the new UUID in it. On rebooting, the new swap area with its new UUID came up automatically, as expected. No more syslog errors either. Part of the reason the swap partition had been trashed is that Ubuntu has become a bit bloated and 1GB of RAM isn't a lot of RAM these days for running a few applications at once. Ubuntu struggles to even install on a box with 512MB of RAM, sometimes hanging. To avoid excessive swap use, it seemed time to max out the RAM to 2GB. A 2GB DDR2 800MHz 200 pin SDRAM SODIMM was found at msy.com.au for around AUD$30. It was not PC5300, but PC6400, i.e. it was 800MHz rated not 667MHz rated. Not a problem. It's working a treat, as evidenced by the screenshot above, showing "Mem: 2052568k total". If you've made it this far, you're probably wondering "why spend money on an old machine?". Well, it's compact, does the job, and linux allows me to make do with ancient hardware that would otherwise get thrown out. I'm happy to spend a bit to keep a machine running for another year or two or three. The next issue is the hard drive. Many would argue that a hard drive with increasing bad sectors is probably in a bit of death spiral. So the next job is to replace the HDD. These have become crazy cheap too these days. AUD$50 for a 5400RPM 500GB Seagate at msy.com.au as well. $50 is cheap insurance if it avoids a catastrophic data loss. Just a quick posting about the i-Kaktusss iambic keyer featured in the May edition of Amateur Radio magazine, published by the Wireless Institute of Australia. The i-kaktusss is an "Iambic keyer and Koch trainer using a seventeen segment screen". It also has PS/2 keyboard support, and provision for simple keyer fabrication with paperclips if desired on the actual PCB, if an external iambic keyer is unavailable. The immediate conversion of the Morse keyed in via the paddles to a character on the LED display makes learning Morse much more reflexive, and the practice modes with pseudo random text and stored text playback avoid all the hassles of practice tapes and CDs, by giving a quick display of the character after it is sounded. It also has modes that play the morse and display the character entered on a PS/2 keyboard. It will also work just fine as a beacon or a plain old iambic keyer. The i-Kaktusss can be powered by either a 12V DC supply or a USB cable. The PCB has been designed with wide tracks and large pads to make homebrewing easier and also soldering by novices easier, and there is copious provision for headers for external wiring if required. The i-Kaktusss is the culmination of my ongoing attempts to become familiar with the gEDA PCB design tools on linux, with guidance from Jim VK5TR and Mitch at Hackvana, who supplied the PCBs. Once you get the hang of schematic capture in gschema, followed by conversion into a PCB design file, and playing with the layout in PCB, you'll try things you'd not dreamt of with breadboards, veroboard, paddyboard/manhatten construction, or deadbug construction. Best of all, the gEDA tool suite is free. The PicAXE software which is free to download is available here and has copious online documentation available here, which will allow builders to modify if needed and load the code onto the PicAXE28x2. Amateur radio is all about collaborative efforts which advance the art, so software patents and restrictive intellectual property rights are not just an obstacle to encouraging the younger generation to solder, code and experiment, they are antithetical. Accordingly, the i-Kaktusss software has been released under a GPL3 licence, and the PCB has been released under the TAPR open hardware licence. BASIC has been used for the first release of the i-Kaktusss to maximise the ease with which programming novices can implement their own changes to the code. The PCBs for my first go at a SMD 50 ohm dummy load arrived the other day followed by the 2200 ohm SMD resistors. The reason it is 50 ohms is because most amateur radio equipment with unbalanced outputs, such as PL-259, BNC or N connectors, is designed to work into loads that look like a 50 ohm resistance to the equipment. Why 50 ohms, and not 75 ohms like a TV antenna? The 50 ohms comes from the practicality that a 50 ohm characteristic impedance coaxial line is a good compromise between power handling and loss. A lower impedance (around 30 ohms) would improve power handling, and a slightly higher impedance (around 70 ohms) would reduce losses, and 50 ohms was chosen as a reasonable compromise. Why do it with SMD parts? The smaller an RF circuit is, the less prone to parasitic inductance and capacitance effects which will make it deviate from ideal behaviour, in this case, behaving like a 50 ohm resistor. More resistors equals more power handling ability, and forty four 2200 ohm resistors in parallel equals 50 ohms, and a nominal 11 watts power handling capacity. My quick and dirty way to solder SMD parts uses a hot plate and a jig to lift the PCB off the hot plate at just the right time. You can also see http://www.ahars.com.au/htm/hb_reflowsoldering.html for more details. We want the dummy load to behave like a 50 ohm resistor, to enable us to see how our equipment we connect to the dummy load is behaving. To know if it will behave like a 50 ohm dummy load, we need to test it. A crude but effective test of the dummy load's behaviour at different frequencies is to use the impedance bridge of the kit built VK5JST antenna analyser. The next step is to get some proper testing done with a vector network analyser or similar gear, for more accurate performance assessment, but preliminary indications are quite encouraging. The optional through hole power measurement components (Capacitor, diode and resistor) can be added later if desired. So, SMD reflow soldering needn't be slow, painful, or expensive. Within half an hour of starting to apply solder paste, the BNC was on and I was testing the dummy load. I recommend double checking the final parallel value for each pair before soldering them in, as it will be harder to find errors once they form a pi network, and I may have made a mistake transcribing the values. Once each pi network is soldered, you can use the white silkscreen rectangle to write the particular pi-attenuator section's attenuation in dB. The photos are detailed enough to give a rough idea of the 1% resistor colour codes. The good VK5TR hath spake unto me that 20dB pi attenuators would verily invite excessive coupling, so yeah, values have not been calculated for 20dB pi networks. Barry, VK5BW, very kindly did some tests looking at return loss, insertion loss, and VSWR. Testing used the photographed step attenuator shown below, with the second BNC connector also soldered on. SWR increases to about 2.0 by 150MHz. Here are some fairly hi resolution photos. You can right click on the images and select "Open link in new tab" if you want to see them at full resolution and skip the default "fit to browser window" slide show format. And now some close ups of the 10dB pi attenuator network, in case the above photos aren't crisp enough. Power handling will depend on the resistors used. Wire wound resistors would add inductance and render the attenuator somewhat useless. Diverging from the design (i.e. resistor placement WRT side of the board, adding shielding between or around sections, etc...) may improve performance, but without further testing you won't know. The transmission line design assumes 1.6mm FR4 with 1oz copper, which is the standard PCB option from Hackvana. Thanks again to Barry, VK5BW for running the tests, and the developers of the gEDA toolsuite under GNU/Linux, without which the barriers to learning PCB design would be much greater.